All over the country, temperatures have been at record colds this winter. What better way to stay warm than bundled up under cozy wool blankets?! Our wool throws are inspired by Italy and made in Maine: our super-fine wool is originally from Italy, then designed and woven right here in Maine. Our ombre wool throws features our fine-spun wool in a gorgeous ombre tone. These smooth and luxurious throws are soft, warm, yet breathable. The 19.5 micron wool creates a tight twill pattern, finished with hand-knotted fringe. These throws show our long tradition of textile weaving paired seamlessly with modern style. These throws go quickly from the back of the couch or the end of the bed to around your shoulders to keep you warm and cozy during these chilly winter nights. 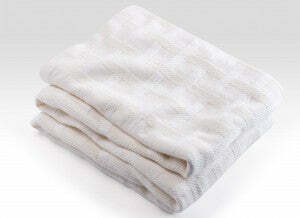 Our merino wool/cotton blankets are lightweight, itch-free, and many are machine-washable. Our blends combine the soft comfort of cotton with the warmth of wool, perfect for frigid days and nights. You can keep a single blanket on the bed or layer them for extra coziness. Luxurious in every way, our wool blankets and wool blends come in a number of textures and colors, so you can find the perfect match for your home!